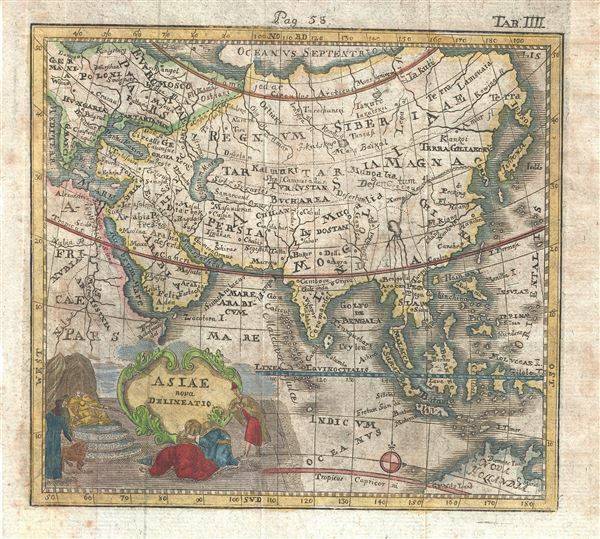 A scarce 1742 miniature map of Asia by German historian Benjamin Hederichs. This map covers the entirety of Asia from Europe to Japan and from the Arctic to New Holland or Australia. The mythic lake of Chiamay, speculated to be the source of the five great rivers of Southeast Asia, appears north of Siam or Thailand. Adjacent parts of Europe and Africa are also noted. Decorative allegorical title cartouche in the lower left quadrant features a golden idol and penitents. Published for Hederichs 1742 Anleitung zu den fürnehmsten historischen.